Anywho! Today's blog is about a little story that happened to my sister and I this holiday season. It was Christmas eve and we received an email from Santa saying that the ribbons for Drake and Penni's gifts (my youngest nephew and niece) flew out of the slay because apparently the elf's fed the reindeer's some Red Bull and the reindeer's were going cheetah fast! Like way fast! So Santa was wondering if we would put a nice big red bow on the kids gifts for him. Unfortunately my sister didn't have any big red bows so we had to improvise. I decided that since we didn't have any big red ribbons or bows lying around I would have to make them somehow. Trust me when a fat jolly old man has been flying in a slay full of Christmas gifts all night and has been from here to Beijing you do as you're told! So I did what any extremly intelligent college graduate (I graduated from two colleges booyah!) would do.. I Googled! I Google searched images of red ribbons and began sketching out a ribbon. Once I felt the ribbon drawing looked Santa approved I began cutting it out and turning it into a ribbon pattern so I would be able to trace the sketch onto red cardboard paper. I have to say that I think that Santa would of been pretty proud of my design. I didn't stay up and wait for Santa because well I didn't want to piss the big guy off. He's got presents! Below are some pics of the Santa ribbons. 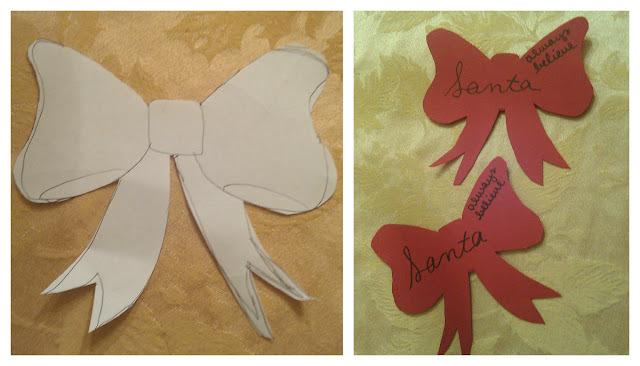 Left: ribbon sketch Right: The final result it reads Santa, always believe. 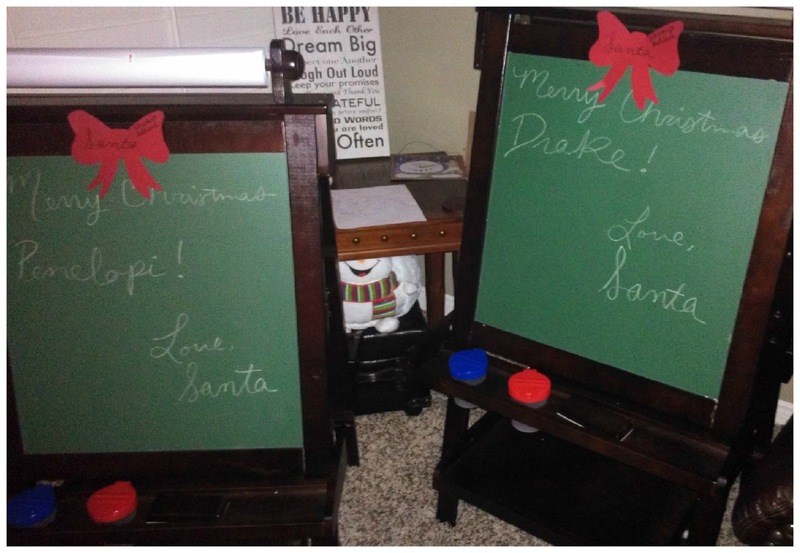 Santa left Drake and Penni some sweet easels for Christmas. I was so jealous!